The weather is warm, the sunshine bright, and hospitality invitations going out all across the Okinawa islands. 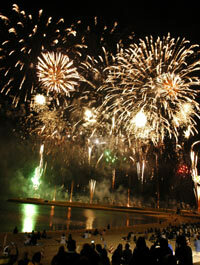 It’s festivals season, a five-month long string of celebrations in every village, town and city in Okinawa. With Okinawa hospitality being what it is, everyone visiting or living on the islands is welcome to not only visit the community festivals, but to participate as well. 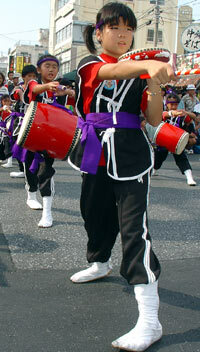 Eisa, the popular folk dances begun centuries ago to entertain the spirits of their ancestors, will play to town folk and visitors alike in virtually every town, village and city across this Ryukyu Kingdom. Eisa is bright, colorful and entertaining. From the drumbeats to the costumes, Eisa is the lifeblood of Okinawa tradition, and makes for fantastic pictures to send back home. Eisa centers around Obon season, the Buddhist festival of the dead. It’s a time when literally everyone on the islands turn the focus back to home and family, and the ancestors. Obon, also known as Bon Matsuri, is celebrated in August here in Okinawa, a month later than on mainland Japan. Expect shops, stores and businesses to be closed during this period, as homage is paid to Okinawan ancestors. Officially, Obon begins on the 15th day of the 7th month of the lunar calendar, but the celebrations continue through November, with songs for the dance coming from Eisa-omoro, songs praising Janamoi, who was responsible for bringing new culture to Okinawa from China. There’s a festival coming up near you, no matter where in the islands you are. This weekend, check out the First Annual Triathlon Carnival in Yomitan. The Sunday event begins at 12:45 p.m., with competitions for everyone from elementary school students on up. The races take place near Hotel Nikko Alivila, about one hour north of Naha International Airport. Next weekend, June 16th and 17th, the 18th Okinawa Folk Dance Festival brings together Okinawa and mainland dance groups. It’s happening at the Ginowan City Gymnasium, with shows running 10 a.m. ~ 4²30 p.m. Saturday, and 9:50 a.m. ~ 5 p.m. Sunday. Admission is ¥1,000 per person. Some village festivals are small, involving just about everyone in town (and sometimes the pets, too), while others are huge, like the 10,000 Eisa Dancers Festival in August. It’s true! Ten thousand dancers find their way through various parts of Naha City enroute to the super parade on Kokusai Dori. This year the festive week runs July 29th ~ August 5th. Dragon boat races are part of the festival season, as those who witnessed last month’s Naha Haarii races. Irabu in the south Yaeyama/Miyako Island district has one this month, and the Manza Beach Haarii is June 24th. Orion, the island’s local brewery, traditionally hosts a few festivals of its own, beginning this year with the Orion Beer Festial in Ishigaki July 1st. Typically, more than 200,000 gather for the Orion Festival. Miyako’s Orion Festival comes up in July, and thee brewery’s hometown, Nago City, has its own celebrations later in the summer. Japan Update will keep readers abreast of specific festivals throughout the summer and fall. Some already on the books are the Bios on the Hill Night Tours running through July 1st, and the Sanitsu Carnival in Miyako July 1st. The July 7th~8th weekend is filled with opportunities ranging from the Camp Hansen Festivalto a Peaceful Love Rock Concert to the Yaeyama Fair in Ishigaki. The following weekend, the Ie Sound Jamboree takes place on the beach of Ie Island on Okinawa’s northwest coast near Nago City and Motobu. Festivals run throughout the summer and fall. 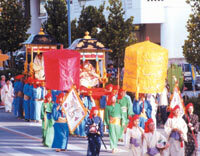 September Œbig events’ include the Itoman Tug of War and the Okinawa Island-wide Eisa Festival. Smaller communities begin fitting in their unique events, as well. October is THE event of the year, the Naha Matsuri. It’s the mother of all festivals, with hundreds of thousands of visitors flocking to the downtown Naha tug-of-war. It’s gigantic, with ropes so big the tug-of-war has pulled its way into the Guinness Book of World Records. The weather begins cooling a bit in Fall, just in time for the Shuri Castle Festival, the Okinawa International Carnival and the Tour de Okinawa, a cycling tour running across the northern stretches of the island, in November. December brings the Naha Marathon, the Kingdom Festa in Ryukyu, and then the holiday season. There are typically 2-3 festivals somewhere in Okinawa each weekend, all offering terrific sightseeing and cultural opportunities. Each has entertainment, foods and carnival booths, and local eisa performers.